Carpal tunnel syndrome can be caused by compression of the median nerve at the wrist, which can lead to pain and weakness in the hand. The median nerve supplies sensation to the thumb, first two fingers, part of the third finger, and also to some of the muscles of the hand. The carpal tunnel is composed of two “walls” — the deep wall is the bones of the wrist and the superficial wall is a thick ligament located just under the skin on the palm side of the wrist. The median nerve and the tendons that flex the fingers to form a fist pass through this tunnel. Certain conditions such as wrist fractures, inflammatory conditions (rheumatoid arthritis, for example) and overuse syndromes can cause swelling in the carpal tunnel. Sometimes there is no identifiable cause. Because the walls of the tunnel are rigid, the swelling increases pressure. Nerves are very sensitive to pressure, and when the median nerve is compressed, the muscles it supplies become weak and the skin over the thumb, index, and middle fingers becomes painful, tingly, or even numb.Carpal tunnel surgery involves 1 or 2 small incisions over the palm of the hand. The surgery can be performed endoscopically (using a small camera attached to a monitor). 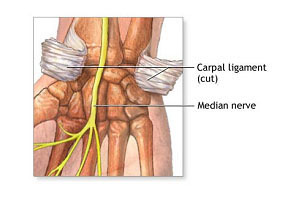 The carpal ligament is directly below the incision(s), in the area of the palm just past the wrist on the palm in the direction of the fingers (distal). This ligament is cut longitudinally (in line with the arm). This releases the pressure on the nerve passing through. Some surgeons will remove tissue surrounding the nerve, especially if the tissue is swollen or irritated (as is often found in arthritis patients). The surgeon will then usually close the skin and subcutaneous tissues over only the carpal ligament, leaving the carpal tunnel uncovered. Other surgeons reattach the carpal ligament after lengthening it. After the surgery, the wrist is usually immobilized in a splint or heavy bandage for about a week. Then motion exercises or a physiotherapy program will begin. Carpal tunnel release is successful in improving strength and decreasing pain in about 85% of properly selected patients. It more reliably resolves pain and nerve tingling/numbness than muscle weakness. Unfortunately, the longer the symptoms have been present, the longer the recovery time and the more variable the extent of recovery. This surgery is usually done on an outpatient basis. Complete recovery can take anywhere from several weeks to a year, depending on the severity of damage to the nerve.A splint may be used to reduce wrist motion for the first few days after surgery, but motion should not be delayed for too long because the wrist can become stiff. The longer the symptoms lasted before surgery and the more severely damaged the nerve appears at surgery, the longer the recovery time. Rarely, injury to another nerve or vascular structure (artery or vein).